Despatch is provided same day from our warehouse with most in stock items that are purchased by 2pm EST. Order for your home or business today in Adelaide, Brisbane, Perth, Melbourne, Sydney, Bendigo, Newcastle, Darwin, Hobart, & anywhere else in Australia! 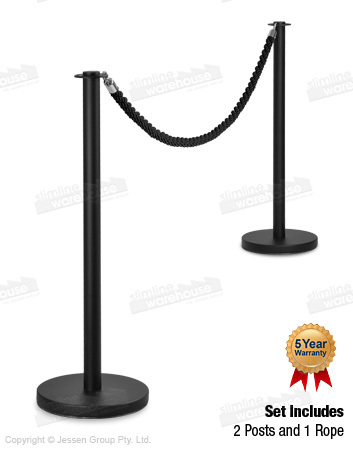 These movie theatre ropes help you easily create a queue or section off areas at your business. 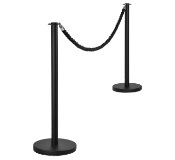 The crowd control stanchions and rope are a full set that includes (2) stanchion posts & (1) braided rope to start you off with everything you need. The 2m long black braided rope has strong clasps on each end to attach to the posts with ease. 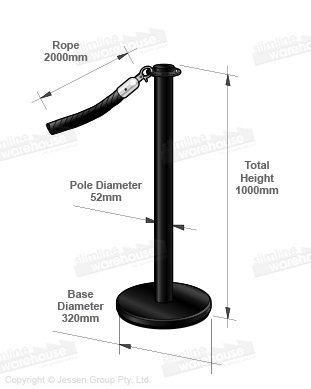 These stanchion posts, movie theatre ropes feature (4) slots on top of the post to go out in different directions easily. Each of the posts is made from steel with a matte black finish to work well with every décor and hold up well to use in public areas. The weighted base of the 1m tall posts offer stability, and utilise a rubber bottom to help prevent damage to floors during use. There are hundreds of products available now for you to purchase in our online catalogue, with the wide variety of options encompassing many categories to ensure you can find the right product for use at your location. With over 20 years in the business, Slimline Warehouse has become a national leader due to our low prices on high-quality items.